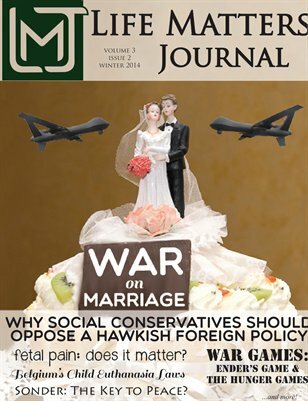 Consistent Life topics abound: War on Marriage - Why Conservatives Should Oppose a Hawkish Foreign Policy; Fetal Pain: Does it Matter? ; Belgium's Child Euthanasia Laws; Sonder: The Key to Peace? ; War Games - on Ender's Game & The Hunger Games, and much more!